There is no intermediate layer of abstraction that stores every detail about every pixel you have drawn. For what we've been doing so far, that limitation has been OK. We have only been drawing one-off lines and shapes, so this very primitive and direct way of drawing pixels hasn't really slowed us down. As we start going down the path of creating more elaborate visuals involving many drawn elements or (gasp!) animated and interactive elements, having some way of controlling the pixels in a very DOM-lite way with a richer scene / model is desirable. In this tutorial, we're going to look at how to do that. Looking backwards, what we want to do is work with our shapes in a way that doesn't involve directly tracking and updating pixels. All of that pixel-related work will still happen, but we will be working at a higher level of abstraction. We will be taking our canvas-drawn shapes and treating them like the more "refined" DOM elements we have in a retained mode system. There are several degrees of getting this DOM-like refinement going. We are going start at the beginning and slowly turn the crank with more involved examples. If you preview this page right now, you shouldn't see anything interesting happening. We just have our canvas element, some styles, and a script tag. That's pretty much it. Don't worry. We will be changing all of that up in a few moments. 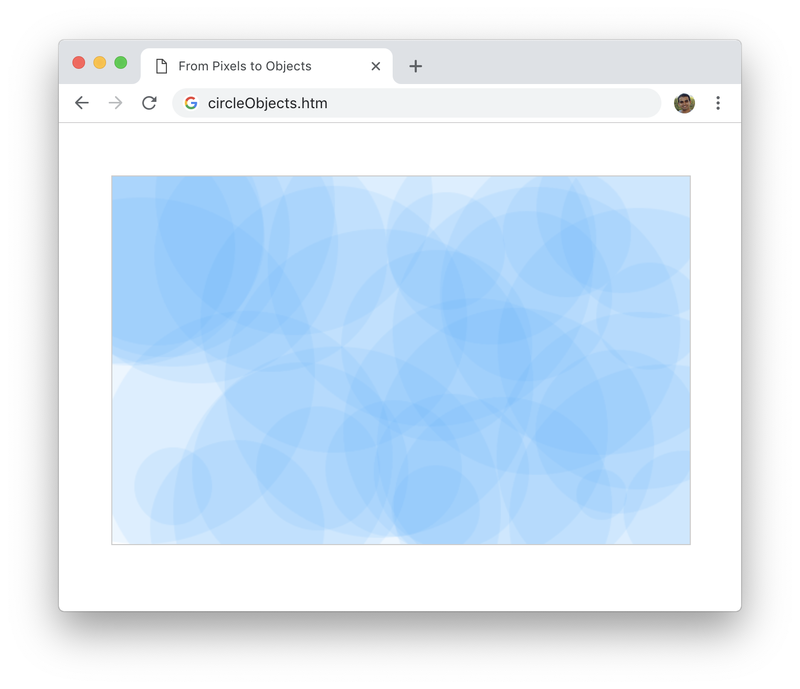 The entirety of this code is just the calls we've already seen for drawing a circle on the canvas. 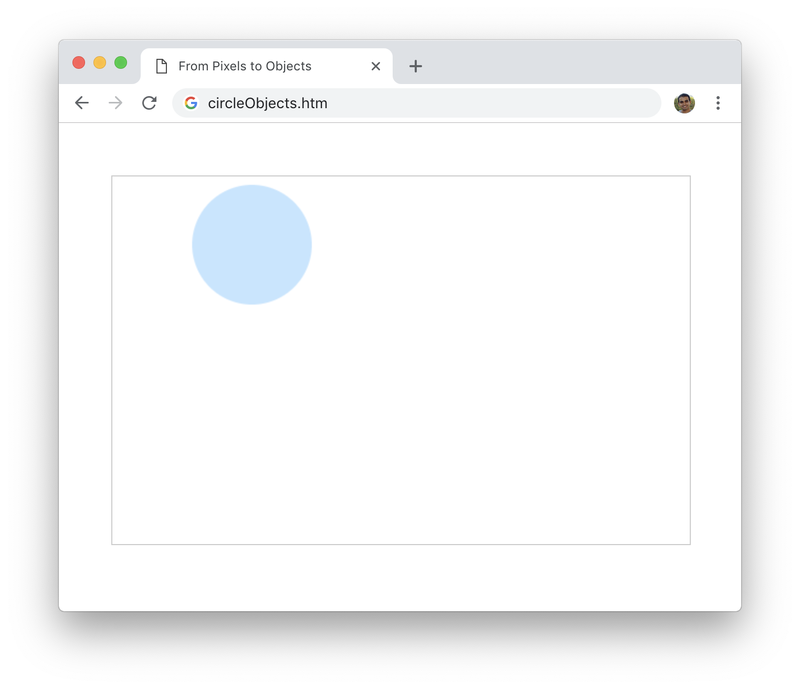 The only variation is that we aren't hard-coding some of the circle's properties. The circle's position, size, and color are passed in as arguments instead. The end result is a circle drawn to our specifications as defined by our draw call in our drawCircle function. That's neat, right? Taking a step back, what we have seen here is nice. By using functions to reduce the tediousness of these drawing calls, we simplify how we get pixels to display on screen. What we haven't done is move the needle in making the shapes we draw more maintainable. 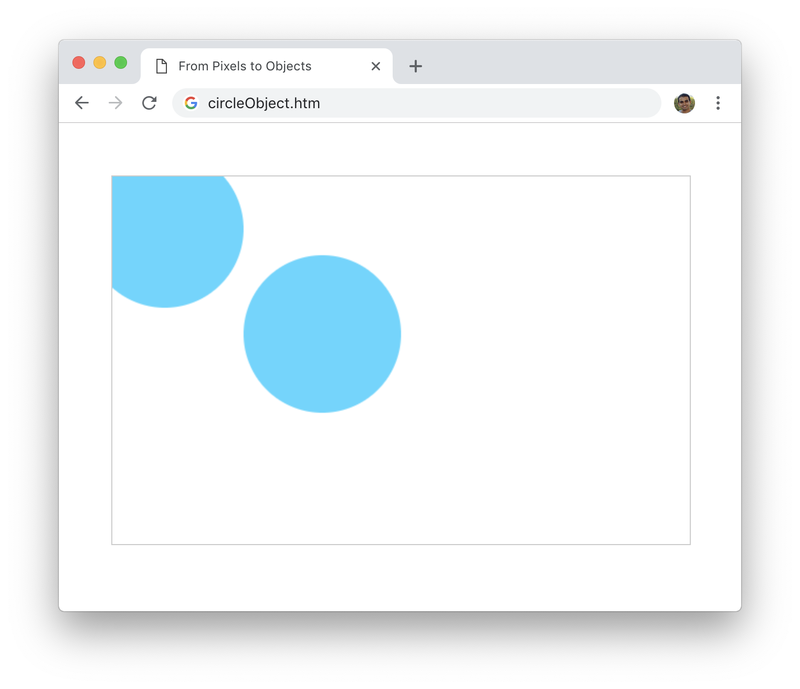 If we wanted to alter how our circle gets drawn, it will require us manually clearing the canvas and re-drawing the circle at the appropriate location. That isn't exactly what we want. We need a better approach. 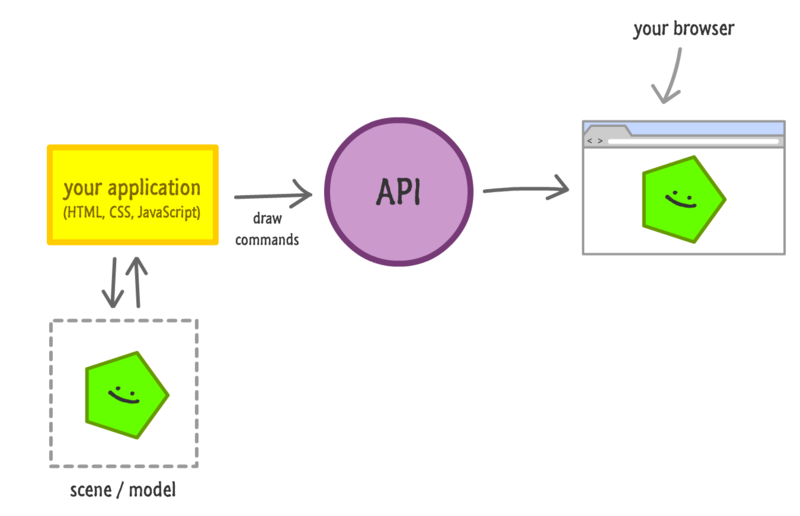 What functions bring to the table in simplicity, they lack in reusability when it comes to the approach we just saw. Once a pixel has been drawn, there is no lingering memory of how it got there. The way we are going to fix this is by relying on mapping our shape to an object. This object will be responsible for everything our shape does such as painting the initial pixels, updating its appearance, and so on. The way we are going to do this is by first creating a class called Circle that will act as the template for the objects we will create. 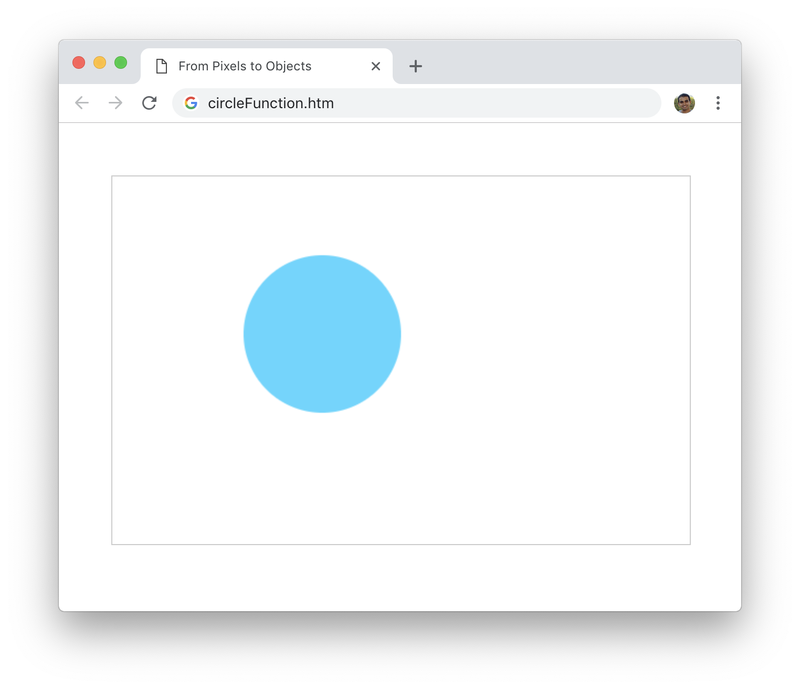 Our Circle class contains a constructor method that sets some variables passed in as arguments. These arguments, just like what we saw earlier with the draw function, specify the position, size, and color of the circle we wish to draw. This isn't a glitch! All we have done is replace our more function-oriented code with one that more directly relies on objects. The arguments we pass in as part of creating each of our circles is identical to what we passed earlier when calling the draw function. That's why the circle we see on screen looks the same as what we had before. What is the major difference? 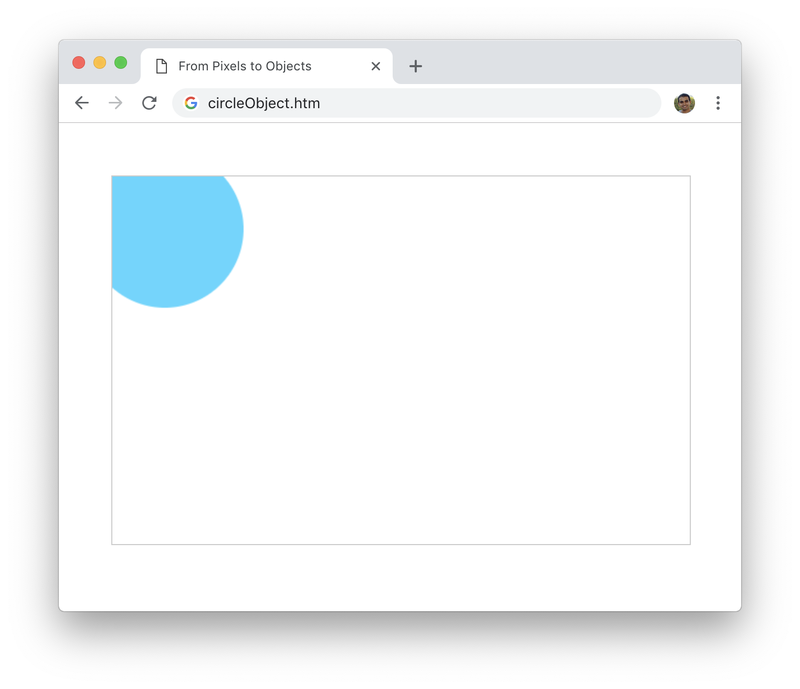 The major difference is that our circle (blueCircle) is represented by an object. That doesn't mean a whole lot...yet. We really can't do much with these objects and the circles they represent. If we wanted to update any of the circles to look slightly different, we can't do that. We are going to fix that next, and we are going to do that by creating a few methods for setting the position, size, and color. We now two five circles painted on the screen. We see the original circle that mimics what we saw earlier, but we see an additional circle where our blue circle seems to be duplicated at the (50, 50) position. I'm pretty sure that's not what we wanted when we decided to update our circle's position. The expectation was that the circle will shift from its current position to the new position - not that it would be duplicated! The reason for this behavior goes back to how drawing on the canvas works. When we draw a pixel on screen, those pixels are permanently stuck there unless we explicitly remove them. This means us updating the visuals of our circle shouldn't just involve updating some property values. It should also involve a repaint operation where the circle in its original state is removed and the circle in its new state is painted on. We are going to all of that in our drawCircle method using the clearRect method we've seen many times in the past. If you test our code again by running our example in the browser, what you see will still be the same behavior. You will still see just a single blue circle. The only change is that we cleared our canvas in a more generic, abstract way compared to what we did a few moments ago. That's a good thing! Yikes! What is going on here? Shouldn't we be seeing about 40 circles on the screen? We are only seeing just one! The reason for this weird behavior has to do with the clearRect call we added to our draw method in the previous section. Each time the draw method is called, the entire canvas is cleared of all that is currently there. This means we only see the last circle getting painted. What you will see is all 40 circles displaying in their unique way with a different position and radius value for each, barring any random values that happen to be the same. Now, what if we want to change the color of all these circles to be red. How would we go about doing that? The	answer lies in taking advantage of the fact that every circle you see is backed by an object. All we need is a way of keeping track of these objects for access and modification later. The way we will keep track is by relying on an array. What we are doing is creating an array called circles. 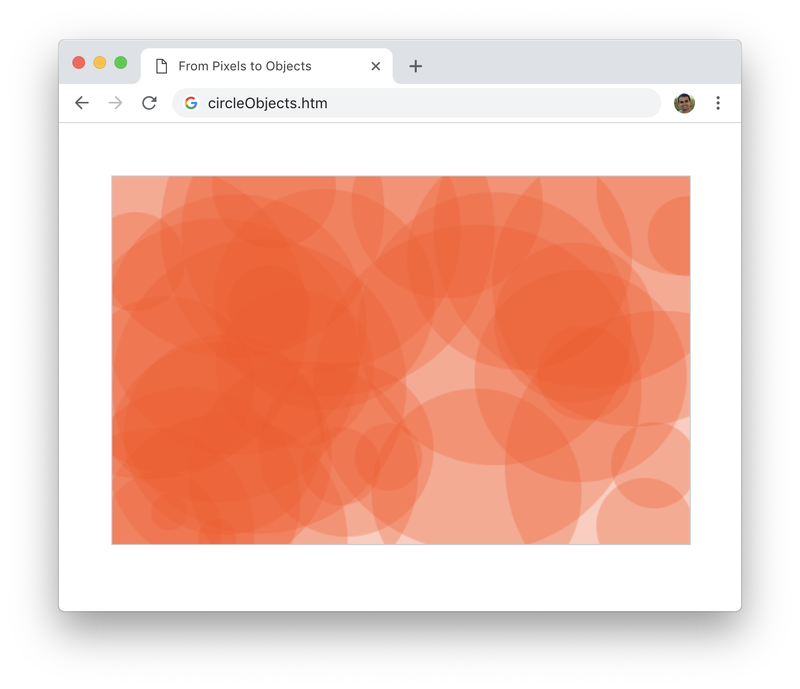 Each time we create a new Circle object, we store a reference to that object in our circles array. What this allows us to do is reference each of our created circles at a later time. This means we can change all of our circles to be red colored whenever we want to as long as we have a reference to all the circles we created. Let's make that color change when we click or tap anywhere on the canvas. The first thing we do is clear the screen of all our existing circles. This allows us to then go through each circle as stored in our circles array, call setColor, specify a red color value, and then call the draw method to get the new pixels to paint on screen. If you are having issues with any of the code from the various sections, be sure to double check what you have with the final version you see here. If we take a step back at everything we've done here, all we did is change one way of organizing our code (using functions) and replaced it with another (using objects). Sometimes, neither of these approaches are necessary. For simple drawings, all of this is overkill. That's why we didn't do anything like this in the many articles prior to this where we looked at each drawing method by itself. Now, as you start to create more complex designs, add animations, or throw in some interactivity, this fast-and-carefree way will end up hurting you in the long run. It makes your code less maintainable, and adding functionality later on becomes a hassle. At that point, you'll be glad to pay the extra initial cost and use something like object approach we looked at in this article.